After a lengthy career working for others, property manager Lynette Boyle strikes out on her own. Outside of General Motors Co. and Bedrock Real Estate Services, which collectively own and manage more than half of the commercial office market in downtown Detroit, there aren’t a lot of opportunities for new players to break through. 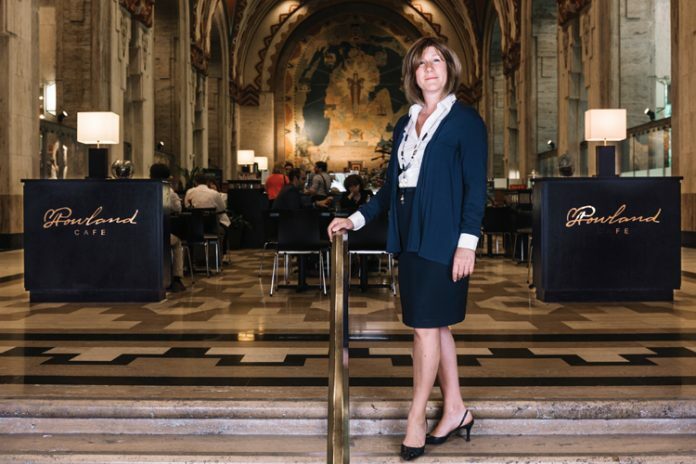 Enter Detroit-based Beanstalk Real Estate Solutions, which got its start earlier this year as property manager of the Buhl Building, a historic, 26-story office tower located in the city’s financial district. At 375,000 square feet, the neo-Gothic structure, like most buildings its size, has seen its share of new and growing office tenants since it opened in 1926. Lynette Boyle, founder and president of Beanstalk, can certainly sympathize with the logistics. Growing up in a one-parent household (she never met her father), Boyle says she and her mother moved 26 times during the course of her upbringing. The stops included Detroit, Hamtramck and, in her teen years, a flat in Grosse Pointe Park. To set herself apart in the industry, Boyle learned from some of the best practitioners in real estate as part of an apprenticeship that spanned 25 years. After completing a degree in interdisciplinary studies and technology at Wayne State University in Detroit, she made the slow, yet steady, climb to entrepreneurship. Today, Boyle knows as much about operating a large office structure as a facilities engineer. “At the Guardian, we helped transfer the building to a long-term (natural) gas contract to save money, fixed all of the electric meters, installed two new cooling towers, and moved the valet parking off of Griswold Street, which was probably the most popular thing we did, given all the traffic downtown,” she says.